Most of you may already know the Supertrend Indicator, it has been available for most platforms including Ninjatrader. There are several versions, some of them free and including different calculation modes. It is basically a trend detection systems very useful also for trailing stop management purposes. 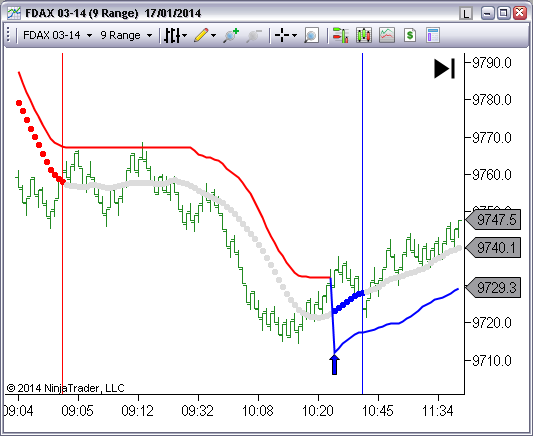 As we can see, this is a very flexible and powerful indicator to define trend and reversals. 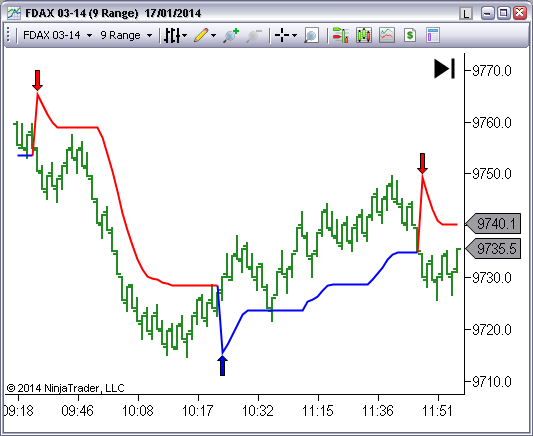 If we are in the Market, the indicator can be used to keep the trailing stop slightly below its line. 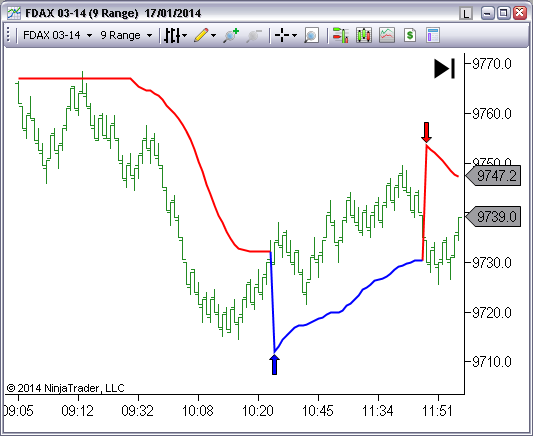 If we decide to use the pullback entry option, then we need to define How to Calculate the Entry. A suggested approach is using same line study used for the supertrend but with a slower period. 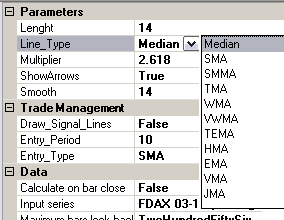 Lets review the SMA example where the supertrend is calculated with an SMA(8) and a multiplier of 2.618. Once we have a trend change ( arrow ) we place a limit order at the SMA. 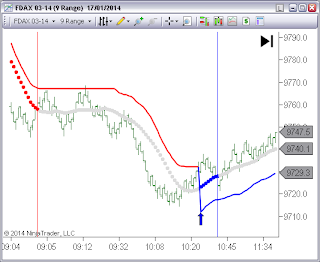 On the following chart we can see a short at red dotted line and then a long at blue dotted line. It is evident that this system will get the best results on impulsive and trending markets when we use runners. When holding a position and using a trailing stop, at some time the trend will lose impulse and there will be a reversal. 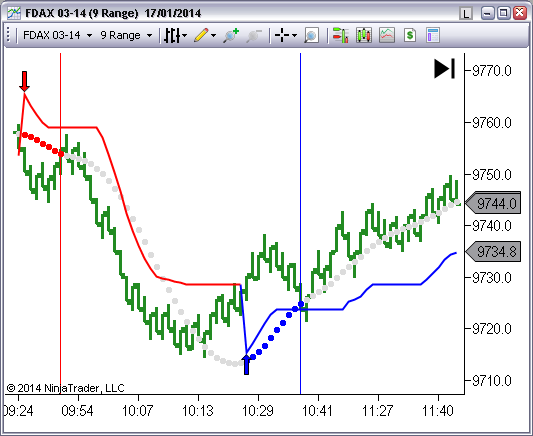 Reverse the Long Position at New Short Entry ( red dots ) assuming the long trailing stop is not triggered. 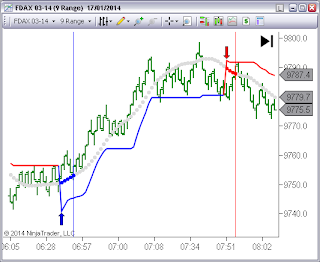 On The Indicator Store we have a Custom TIS_Supertrend Indicator with all the User defined settings to define the Trend and also a user defined Entry as shown on previous Chart. 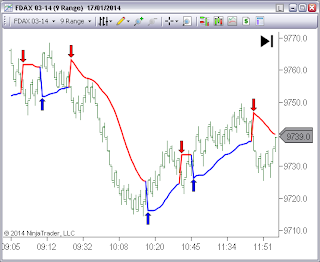 If you like the Supertrend possible Setups using the rules explained, we have also the PMS_Supertrend ; a Semi Automatic and also Full Automatic System that trades all possible trade setups described. It has the option of Early Exit; in case we are holding a position, and an inverse arrow ( trend change ) is painted we can decide if closing actual position or not. If we decide not using early exit, then the current position will be exited at trailing stop or reversed at new entry. As on all our PMS systems, the system uses ATM Orders, so we can define 3 positions with its own size, target, stop, trailing stop and auto break even. The user can also move the orders without affecting the System.